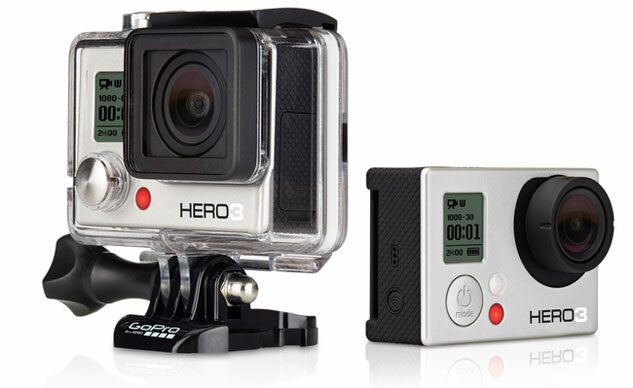 The HERO3 White Edition is GoPro's budget entry in the HERO3 line of action cameras. It doesn't tout as many features as its more advanced siblings, but it still packs enough punch to appease entry-level action sports enthusiasts. This is the perfect camera for budget-conscious photographers. The HERO3 White Edition doesn't claim to be anything besides average, but its reliability and available add-ons make it a strong contendor. The HERO3 White Edition holds true to GoPro's point-and-shoot design, with an f/2.8 lens sharing space with the LCd panel on the front. The front of the camera also features a button for accessing the settings menu as well as an LED to indicate recording. The button on the right side enables/disables Wi-Fi and connects the camera to the GoPro app on a smartphone or tablet. The left side holds a microSD card slot, a micro-HDMI port, and a mini-USB port. An optional 3.5mm adapter will let you plug an external microphone into the mini-USB port if you don't want to use the camera's built-in microphone. The back of the camera gives way to the rechargeable battery. The HERO3 caps out at 30fps 1080p video. A staple of the GoPro's camera is its ultra-wide fisheye lens, which is supported on all resolutions except for 1080p. The HERO3 can record up to 60fps for 720p and WVGA video, but only 30fps on higher resolutions. The HERO3's built-in video features make it extremely versatile: photos and videos are bright. vibrant, and detailed. The Spot Meter setting helps the camera adjust to bright environments when the camera itself is in a dark location such as a car. The 5 megapixel (MP) camera is capable of taking photos in burst mode up to 3 photos per second, or time lapse mode in intervals ranging from 0.5 to 60 seconds. The HERO3 White Edition is rated for 3 hours of battery life recording footage at 30fps 720p. This estimate drops by roughly half an hour when using Wi-Fi, which is something you want to consider if you frequently use the GoPro app. The HERO3 White handles high-definition video flawlessly, and while there are cameras that support higher frame rates the HERO3's resolution and frame rate will work well enough for most users. The HERO3 is small enough to mount comfortably to a vehicle or even to yourself, and the included waterproof casing will let you bring it underwater to a maximum depth of 60 meters. GoPro provides a huge variety of mounts for attaching the HERO3 to helmets, bikes. boards, ski poles, goggles, and more. The built-in microphone works well in most cases, although the 3.5mm micro-USB adapter will let you attach a higher quality external mic. 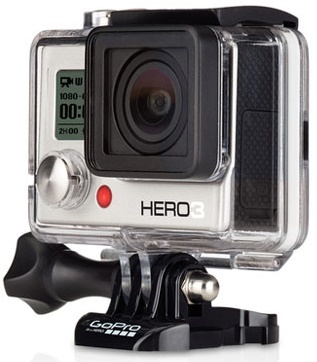 GoPro also provides add-on accessories known as BacPacs to extend the features of the HERO3. The LCD Touch BacPac, for instance, adds a full color touchscreen for previewing and playing back images and videos. The HERO3 is a great entry-level action camera for beginners and casual users. While it won't make waves with its design or feature set, it provides just enough to record high quality video without breaking the bank. Best of all, you get access to GoPro's arsenal of mounts and accessories to expand the functionality of the camera.